I have a series of recorded lectures about all sorts of topics in U.S. History and in one of them, a professor mentioned some new psychological disorder they think TR had. I don't remember the name, and to be honest, I'm not going to sit through the hour long lecture again to find out. Suffice to say, the disorder was summed up as Can't-Sit-Still-Always-Has-A-Million-Things-To-Do-And-Drops-Dead-At-An-Early-Age-From-Exhaustion. Roosevelt was a poster child for the disorder. He dared a lot. The man wrote 30 books, fought in the Spanish American War, went on Safari to Africa, explored an uncharted river in South America (Rio Roosevelt), was Police Commissioner of New York, Governor, Vice President, President, Nobel Peace Prize winner, trust-buster, National Park creator, yada, yada, yada. 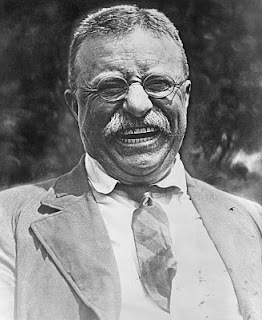 Now, I'm no where near as accomplished as Roosevelt, but I sometimes think I suffer from the same new-fangled disorder. (Only I hope to not drop dead at a young age.) I have a hard time sitting still. I make to-do lists for myself on the weekends. I have a gazillion things I want to accomplish before I die, or better yet, before I turn 30. (Yeah, that's coming up soon. Ugh.) I try to dare mighty things. But I need a break. So I'm taking a few days off from blogging. It's my first non-vacation related blog break so I'm going to test out how much more I can accomplish without the internet. I have a feeling it will free up a fair bit of time. Of course, I'll still be at the Secret Archives of the Alliterati on Thursday, but otherwise, I'll see you Monday!